Soo excited to write this blog, just wanted to bring to your attention this little cute outfit for under 20 quid, can you believe that?? 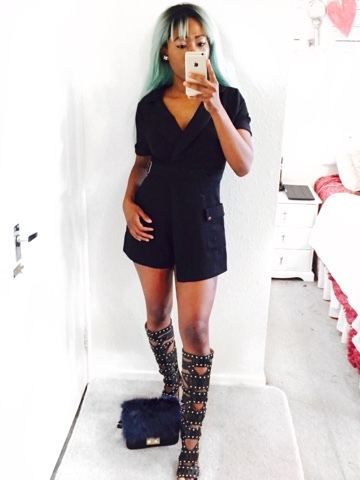 You don't have to break your account to look good 😊.. so here you are guys these knee high gladiators are from Missguided £11, this was one of my best bargains... my black playsuit was from Primark £3, to me this can easily turn from a day to night outfit a change in lip colour and you are good to go, and lastly the little leather faux bag was only £2 from primark, what I love the most about this bag is that it has a very luxurious feel and look 👀. Did you guys buy anything from the winter sales ? Disclaimer-: All items were bought on sale. Awww thank you so much, definitely know how you feel, too back some asos boots because they were too tight.